Youth baseball signups are 10 a.m-1 p.m Saturday, Feb. 28, in the cafeteria of Abraham Lincoln Elementary School. Enrollment is for ages 4-15. For more information, call Ronnie Chelf at 270-268-1115. The LaRue County High School Lady Hawks softball team will conduct a softball clinic for girls 12 and younger Saturday, Feb. 28, at the high school field house. Registration is at 8:30 a.m. The clinic starts at 9 a.m. Cost is $20 per individual or $30 for multiple family members. All proceeds go to the softball program. For more information, call Jeff Shelton at 358-3384. 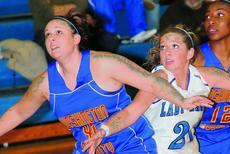 LaRue’s Lady Hawks defeated the Washington County Commanderettes 55-45 in their homecoming game Feb. 17. Washington County hit 39 percent of their field goal attempts and 33 percent of 3-pointers. LaRue hit 27.8 percent of field goal attempts and 17 percent of 3-pointers. LaRue’s free throws made the difference, hitting 64 percent of shots. LaRue hit 22 of 34 free throw attempts; Washington hit 7 of 23. The LaRue County Mat Hawks finished the season at the KHSAA State Wrestling Tournament as runners up in the small school division and seventh overall. Four Mat Hawks finished in the top eight of their weight class. LaRue County became the first team to qualify for the boys' 5th Region basketball tournament with a vin Monday night in the 18th District Touranment opener at Hart County High School in Munfordville. The Hawks' 53-47 win over host Hart County moves LCHS into the district championship game Friday night. Both the winner and the runner-up advance to the eight-team regional tournament next week. The Hawks will face the winner of Tuesday night's matchup between top seeded Green County and Caverna. The slimmest of margins separated first from third at the middle school state wrestling tournament. In the end, the Mat Hawks fell short of winning their fourth straight middle school state championship, finishing in third place, just four points out of first place. A girls’ youth softball meeting is planned tonight at the LaRue County Parks and Recreation building to organize the softball season. It begins at 7 p.m. Anyone interested in helping or coaching may attend. This meeting is not for signups. Signups will start in March. For more information, call Regina Devers at 234-6217. The slimmest of margins separated first from third last weekend at the middle school state wrestling tournament. In the end, the Mat Hawks fell short of winning their fourth straight middle school state championship, finishing in third place, just four points out of first place. The LaRue County JV wrestlers traveled to St. Xavier High School this past Saturday and competed in the second annual JV state tournament. Out of 24 participating schools, the young Mat Hawks finished fifth. Three wrestlers medalled including one state champion. Freshman Dylan Sheldon earned state champion honors in the 112-pound class with victories over Jacob McCarthy of Bullitt Central, Damon Reed of Woodford County and Kris Jones of Franklin County. After pinning his first two opponents Sheldon won a hard fought contest with a 14-12 victory in his finals match. The LaRue County High School Mat Hawks qualified 11 wrestlers to the state tournament in Frankfort starting tomorrow. The Hawks had five regional champions, three regional runners-up and a second place team finish. Eight points separated first from second place this past weekend at the Region 2 wrestling tournament at Fort Knox on Saturday. John Hardin edged LaRue County for the wrestling crown for the second year in a row.